The governor wants to make it hard for his successor to reverse his 'common-sense' executive directives tightening access to benefits. AUGUSTA — Gov. Paul LePage unveiled a package of proposed welfare changes Tuesday that seek to put into law the executive actions his administration has made to tighten access to assistance programs while beefing up work requirements. 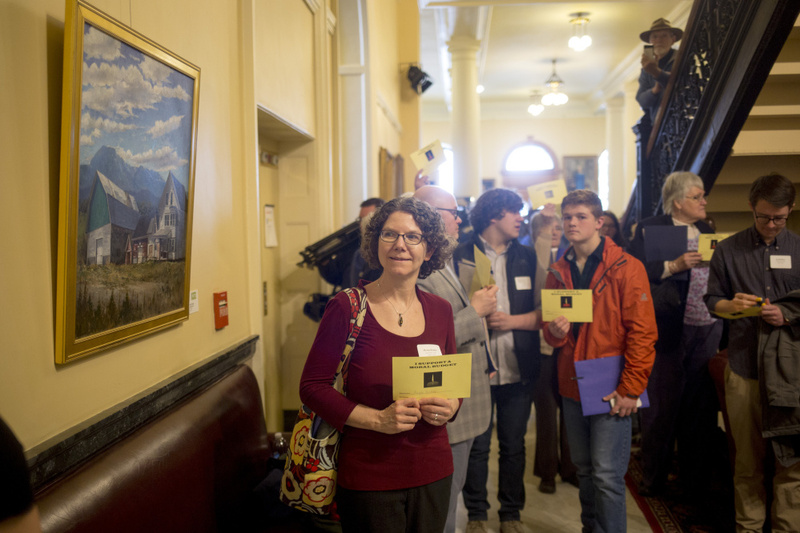 Several of the proposals outlined by LePage were introduced as bills in the past but have failed in the Legislature in the face of opposition from Democrats and advocates for low-income Mainers. 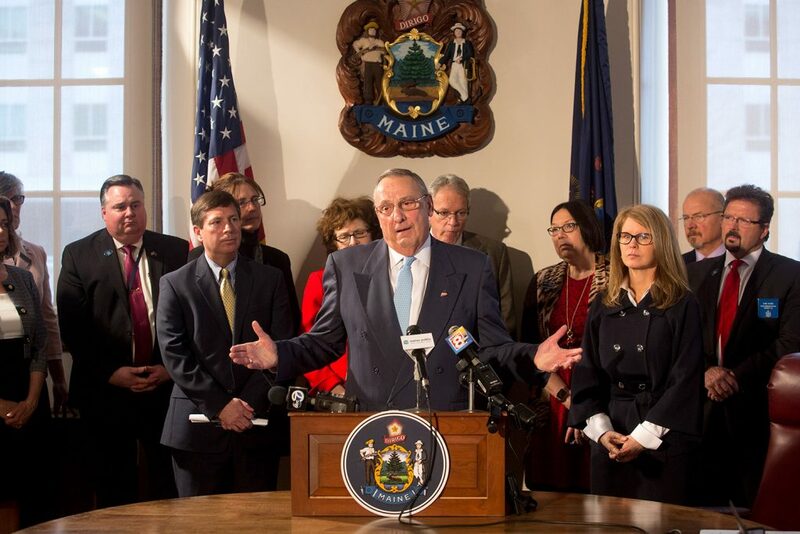 Flanked by Republican lawmakers, LePage said his administration’s policy changes are deterring fraud, reducing state spending and helping Mainers transition out of welfare. “They can also be reversed by the next governor, and that is why it is so important to make these common-sense reforms in state law,” LePage said. • Requiring 20 hours of work or vocational training weekly for able-bodied adults receiving assistance. • Placing photographs on electronic benefit transfer – EBT – cards. • Limiting households to 36 months of Temporary Assistance for Needy Families down from the current 60-month cap. • Imposing a $5,000 asset limit on childless households receiving food assistance. • Banning “repeat felony drug offenders” from food assistance. • Disqualifying all adults in a household from receiving assistance if one member is convicted of welfare fraud or theft. • Discontinuing assistance to people who win $5,000 or more in the lottery or by gambling. Many of the proposals are expected to encounter strong opposition, once again, from Democrats and advocates who say LePage’s welfare changes during the past six years have only hurt many low-income families and children. Democrats were quick to point out that child poverty rates and infant mortality rates have actually increased in Maine in recent years. LePage’s final two-year, $6.8 billion budget plan also contains controversial proposals to eliminate welfare benefits for some immigrants and to reduce the rolls of MaineCare, the state’s Medicaid program. LePage has made welfare reform a cornerstone of his two terms and both of his campaigns, and has had success at changing rules and eligibility requirements for programs such as Medicaid, food stamps and Temporary Assistance for Needy Families. Although lawmakers approved some of those changes, LePage also has used his executive authority to effect other changes to the safety net programs used by hundreds of thousands of low-income Mainers. For instance, the administration now requires able-bodied adults to work, volunteer or receive vocational training to obtain food assistance. The LePage administration says those work requirements have led to a 114 percent wage increase for those participating. 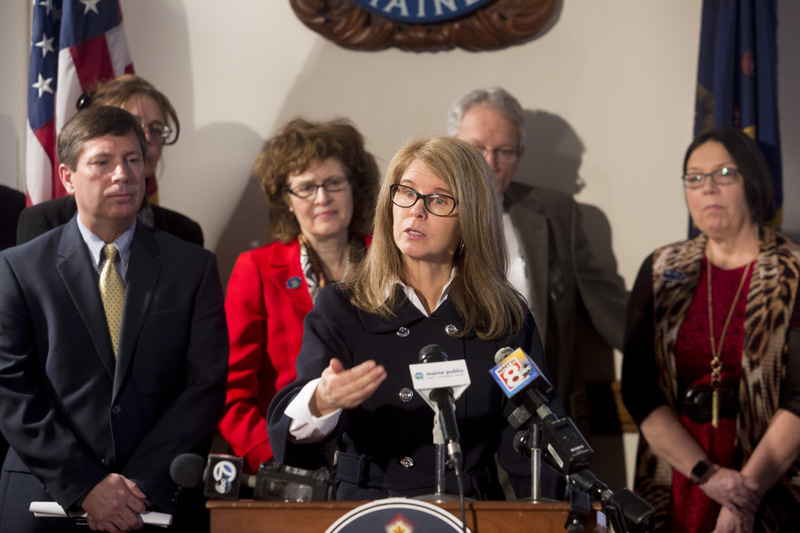 DHHS Commissioner Mary Mayhew speaks at Tuesday’s news conference. She and Gov. Paul LePage spoke about welfare “dependency” and welfare fraud. The LePage administration also instituted a voluntary system for adding photos to electronic benefit transfer cards as a way to discourage fraud. The governor had wanted to make the photos mandatory, but the U.S. Department of Agriculture under former President Barack Obama rejected that request in 2013. It was unclear Tuesday exactly what LePage’s bill would propose for EBT card photos. However, the governor already is renewing several requests to the Trump administration that were rejected by the Obama administration. Notably, there were no Democrats standing behind LePage during his late-morning news conference. Rep. Kenneth Fredette, R-Newport, the House minority leader, noted that the governor was re-elected in 2014 and that his party maintained control of the Maine Senate in 2016. But Joby Thoyalil, a policy analyst with Maine Equal Justice Partners, portrayed LePage policies as moving the state in the wrong direction by denying assistance to people who need it. LePage and Health and Human Services Commissioner Mary Mayhew also spoke repeatedly of welfare “dependency” and welfare fraud, two favorite topics for the Republican governor. In 2016, the DHHS referred 174 criminal cases to the Maine Attorney General’s Office alleging more than $1.7 million in fraud or theft. Those resulted in 37 cases in which recipients were ordered to pay more than $500,000 in restitution, the Attorney General’s Office said.